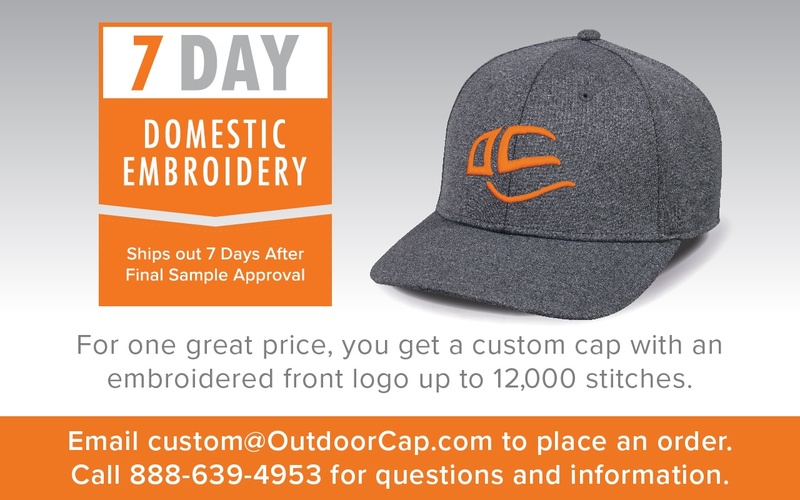 Orders must be emailed to custom@outdoorcap.com. Phone orders are not accepted. Every effort will be made to ship exact quantities as ordered, over/under run rate of 5% is standard on all embroidered orders. Orders over 720 pieces may require additional lead-times. All shipments are FOB Bentonville, AR. Drop shipments up to 6 locations are FREE, additional locations will be charged $2.50/location (A). Digitizing services are FREE and no set-up fees are required. Vector art is REQUIRED with logo specifications/Pantone® colors to ensure timely delivery of sewout. Please note that art sent in a format other than vector may require additional lead-time. DST files are accepted if color run sequence is provided. We reserve the right to edit DST files in order to deliver a quality product. Editing files will require additional time to deliver sewout for approval. Spec samples are provided at no charge. No cancellations or changes will be accepted after production PO is placed with overseas factory.